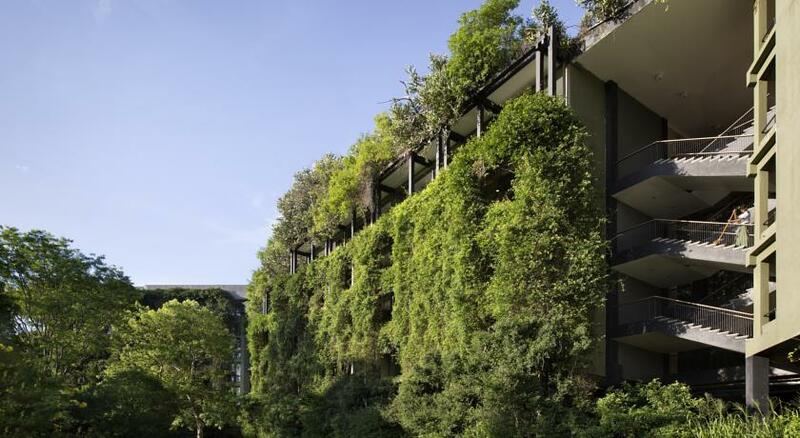 Several Weeks later I saw one image, a hotel with full of greeneries looks like the building is attached to nature. The Name of the Hotel is Kandalama. Though the west wing is visible from the entrance road, it was heavily camouflaged by planting in order to minimize its visual impact on the arriving guest so it ultimately does not detract significantly from Bawa’s designed approach. Being one of Bawa’s earlier moves toward minimalism in building detailing, the design of the Kandalama Hotel was shocking to admirers of the vernacular influence visible in his previous projects. However, the subtlety of the architecture itself effectively foregrounds the drama of the cliff-side topography and breathtaking views. The Kandalama Hotel is a nine-kilometer drive east of the small town of Dambulla. The main entrance lobby is located at the end of a ramped 2.7-kilometer-long private road that branches north from a secondary arterial leading back to the center of town. From the earliest development phase of the project, Bawa was interested in developing a spatial and visual sequence of entry that culminated in the revelation of the distant view of the monument of Sigiriya only after entry to the hotel lobby. I did research about Kandalama, found the building performance in archnet which is the world’s largest online databank of Islamic architecture. It was developed at the MIT School of Architecture and Planning in co-operation with the Aga Khan Trust for Culture. It provides users with resources on architecture , urban design and development in the Muslim world to all users . Kandalama shows as example how Bawa’s later approach.Bawa’s earlier works are purely aesthetic and reflect the architect’s evolving personal design philosophy. The Kandalama Hotel follows the model of his later projects, in which the majority of the ornamentation comes from sculptures and artworks by other artists distributed around the building. The detailing of the architecture itself remains plainly yet harmoniously articulated in neutral tones and natural materials, including white concrete walls, black painted concrete columns, and wood or iron railings and millwork. This hotel reminds me about Norman Foster when he strived for improving the building performance more than architectural articulation. The Kandalama features innovative building technologies and systems designed to mitigate the environmental impact of the building’s operation on the catchment of the nearby lake. The Kandalama Hotel is an excellent example of how tourist facilities can be integrated into an undeveloped landscape successfully, fostering appreciation for the natural beauty of the setting while minimizing negative environmental consequences. There were interesting stories and comparison the attitudes of influence and inspiration, among Mies, and Corbusier. Historian Reyner Banham would tell how he had interviewed Le Corbusier in Paris in the late 1950s. he was curious about the inspirations of Corbusier’s mind, Corbusier and Mies van der Roher both working for Peter Behrens in Berlin in 1911 and together they went to hear a lecture on Frank Llyod Wright by Dutch architect Berlage. When questioned by Banham, Corbusier insisted’ Frank Llyod Wright, “I don’t know that name. This was the same Corbusier who in 1912 design his parent house inspired by Frank lyyod Wright. Some architect found that they were orginal and that there genious, self trained, being avant garde and centre of attention. Creating honest design, and performance based design is fundamental for design rather than attitude for being avant-garde, In the term of solving problem, we have to connect with the users, make them happy, nurture them, satisfy the land and the human. It will be good for students to understand and practice them. It’s like Gaston Bachelard’s Poetics of space, he believed in imagination, the best work is to left the imagination and some part of the chest is closed and left for interpretations for admirers. I remember my childhood, with my family, in our family, I was thought by my father and mother, to have perfection in work, nurture the family, while staying real, and honest with everybody. That is why they gave me name realrich. I just think that the word “family” is getting bigger.One of them is student, and another future architect, the other family is Laurensia and cute Miracle who gave me love every day. the attitude makes the originalism.